AsTray Plus version 1.3.6 is out, and the latest version adds a handful of bug fixes and a whole slew of useful new screen resolutions. 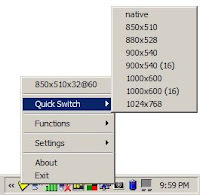 AsTray Plus is a Windows utility that lets you squeeze more content onto an Eee PC’s 800 x 480 display. Of course, you can’t actually add pixels to the screen, but you can use some font tricks and other tweaks to make your computer act like it has a higher resolution display than it actually does. Earlier versions of AsTray Plus added virtual display resolutions of 1024 x 768, 1000 x 600, and 900 x 540 pixels. The latest version adds two more, 880 x 528 and 850 x 510. You wouldn’t think a few pixels would make much difference, but when you’re trying to read a web page that’s just a tiny bit too wide for your screen, you’ll see how valuable those new resolutions can be. The other thing to keep in mind is that the closer your virtual resolution is to the device’s native 800 x 480 resolution, the easier it will be to read text on your screen. While you can use the 1024 x 768 mode if you have a program that absolutely requires it, good luck actually trying to make any sense of any text at that resolution. AsTray Plus 1.3.6 also adds the option to change your color depth from 32 bits to 16 bits automatically, which can also save some strain on the eyes at non-native resolutions. For a complete list of changes, check out the EeeUser Forum thread. And you can find installation instructions at the EeeUser Wiki.